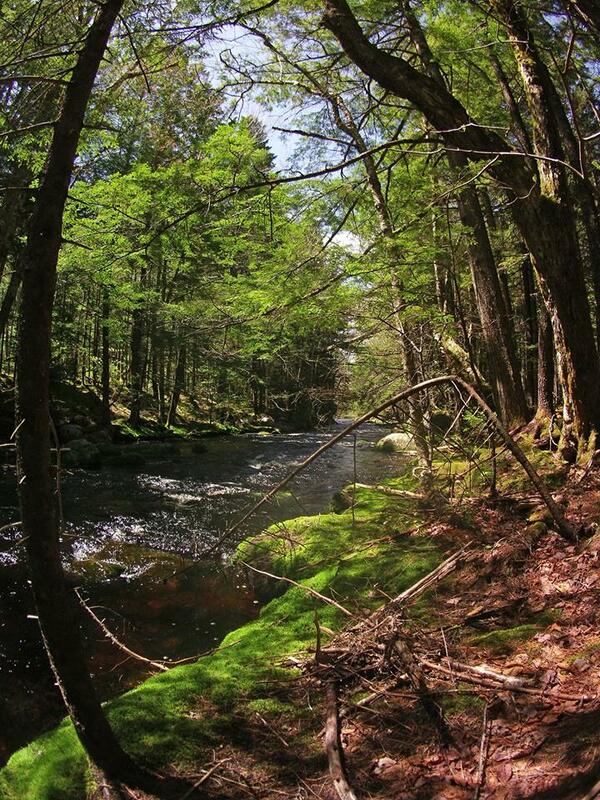 What’s good for salmon is good for trees in Nova Scotia…and v. versa! For the sake of the forests and salmon, it’s time for NSDNR/Westfor to heed the science and put the brakes on clearcutting in SW Nova Scotia. I was pleased to read in the Dec 2016 issue of Rural Delivery that NSDNR soil scientist Kevin Keys is participating in a 3-year experiment to examine the efficacy of liming forests for the benefit of salmon and trout in Nova Scotia river systems stressed by acid rain. The experiment is being conducted along the West River/Sheet harbour where in 2005 the NS Salmon Association set up a lime doser which feeds powdered lime mixed with water directly into the river. The lime increased calcium levels and pH which resulted in many more salmon smolts going out from the river. Smolt numbers increased from about 2000 initially to 10,000-12,000 recently. Now the Nova Scotia Salmon Association and the Eastern Shore Wildlife Association, with the support of Fisheries and Aquaculture and NSDNR and federal agencies have started some liming on adjacent forested land using helicopters. Based on experience in Europe, it is hoped that terrestrial liming will be cheaper than adding lime directly to the water, involve much lower maintenance and be more effective over a larger portion of the watershed as well as for long periods of time. (If the lime doser stops, the water acidifies very quickly). The terrestrial liming at West River/Sheet harbour follows and is informed by two smaller-scale terrestrial liming experiments conducted on smaller catchments located within the Gold River Watershed in New Ross, Nova Scotia under the direction of Dalhousie researcher Shannon Sterling. It’s pretty complicated stuff, with a lot of site to site variation, and precautions have to be taken not to negatively impact acid-loving species. If successful, the approach could be used on other watersheds in the southern uplands of Nova Scotia. 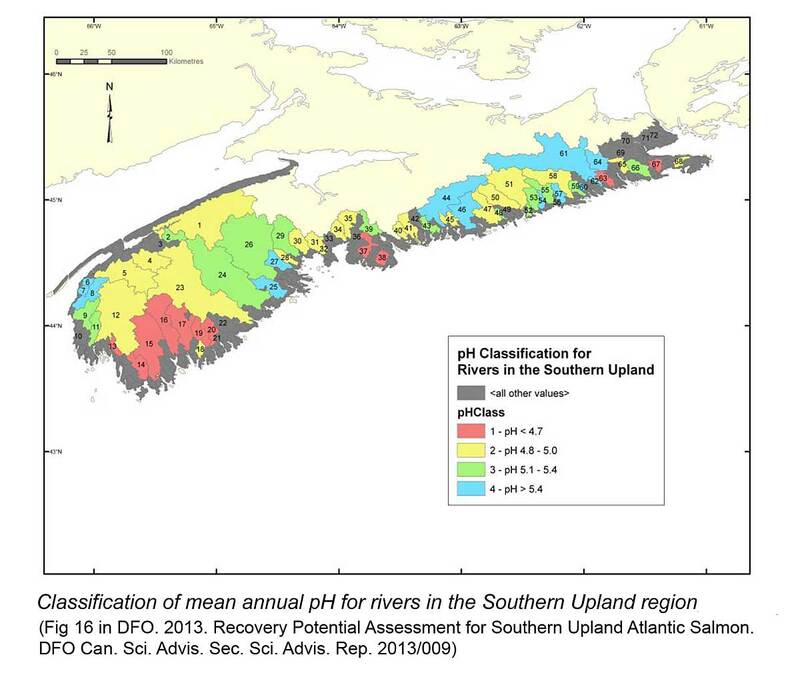 Rivers in SW Nova Scotia have been the most strongly affected by acid rain. Further, unlike other regions in northeastern North America which have seen a response to controls on smokestack emissions, pH and calcium have continued to decline in many watersheds of SW Nova Scotia, an anomaly attributable to the exceptionally poor buffering (nutrient supplying) capacity of the affected landscapes. While the prime target of the liming is salmon, it is expected that brook (speckled) trout and likely other aquatic species from zooplankton to loons could benefit – and the forests themselves. Many studies have shown that declines in calcium under forests have diverse adverse effects either through calcium deficiency directly or indirectly through increased acidity, aluminum mobilization and enhanced mercury toxicity e.g., on cold tolerance of red spruce, sugar maple decline, forest salamanders and snails, forest herbs, invertebrates and song birds. So it makes sense that NSDNR is taking an interest in the liming experiments. While the project is aimed at restoring West River Sheet Harbour, terrestrial liming also has the potential to benefit forests. Kevin Keys, a site productivity forester with Nova Scotia’s Department of Natural Resources, is an aficionado of dirt. He and others will be studying the impacts of terrestrial liming on the soil itself, taking samples from limed and unlimed areas and gauging the potential for speeding up forest recovery in regions diminished by acid rain. The way Keys describes it, the bank of nutrients in the province’s soil has been cleaned out. He says forests’ reduced capacity to regenerate after harvesting needs to be incorporated into management practices, and the provincial government is moving in this direction. 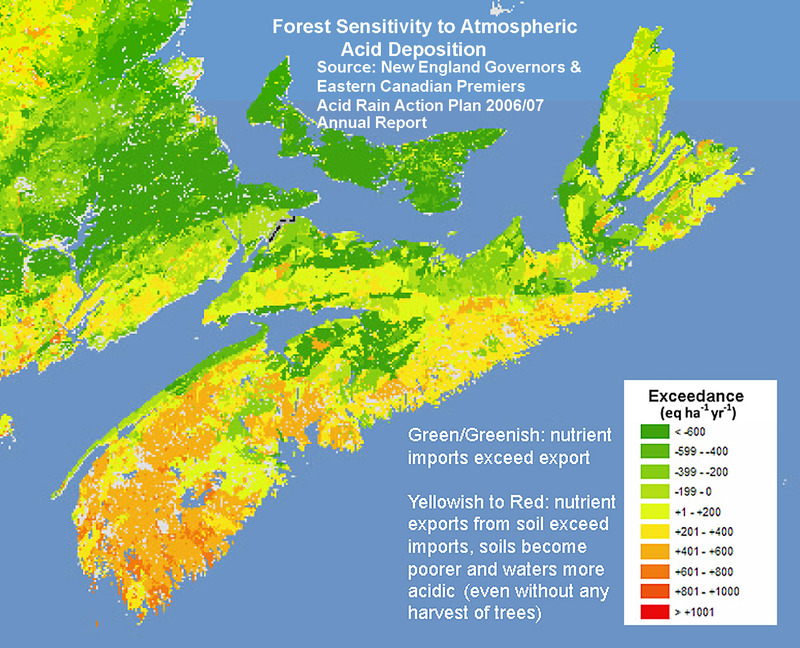 In a paper on the NS Forest Nutrient Budget Model published earlier this fall, Keys and co-authors acknowledged that “harvest removals can exacerbate declines in base cation levels (especially Ca) in affected soils”, an admission, perhaps, that clearcutting has some downsides for forest productivity AND aquatic systems. That’s Progress. It can’t get into the forest planning processes soon enough. It would make most sense simply to severely restrict if not ban clearcutting in whole watersheds severely stressed by acid rain. We already know which watersheds those are (view figure above). As well as speeding up improvement of water chemistry for salmon and other species, such restrictions would prevent other deleterious effects of clearcutting on salmon habitat. What’s good for trees is also good for salmon! There is a hitch however. The most severely affected watersheds are in the Western Crown Lands (“the last great wood basket”) that the NS government is handing over to the Westfor group to manage and cut. In fact they are just completing the first year in a planned ten year deal that would see a lot of clearcutting. From: Miller, E. et al. 2007. Mapping Forest Sensitivity to Atmospheric Acid Deposition. Conference of New England Governors and Eastern Canadian Premiers Forest Mapping Group Report. For the sake of the forests and salmon, it’s time for NSDNR/Westfor to heed the science (including their own) and put the brakes on clearcutting in SW Nova Scotia. Southern Upland (SU) Atlantic salmon (Salmo salar) was assessed as Endangered by COSEWIC in November 2010. The Southern Upland DU of Atlantic salmon consists of the salmon populations that occupy rivers in a region of Nova Scotia extending from the northeastern mainland near Canso, into the Bay of Fundy at Cape Split…Based on genetic evidence, regional geography and differences in life history characteristics SU Atlantic salmon is considered to be biologically unique (Gibson et al. 2011) and its extirpation would constitute an irreplaceable loss of Atlantic salmon biodiversity. FLYLIFE MAGAZINE, MAR. 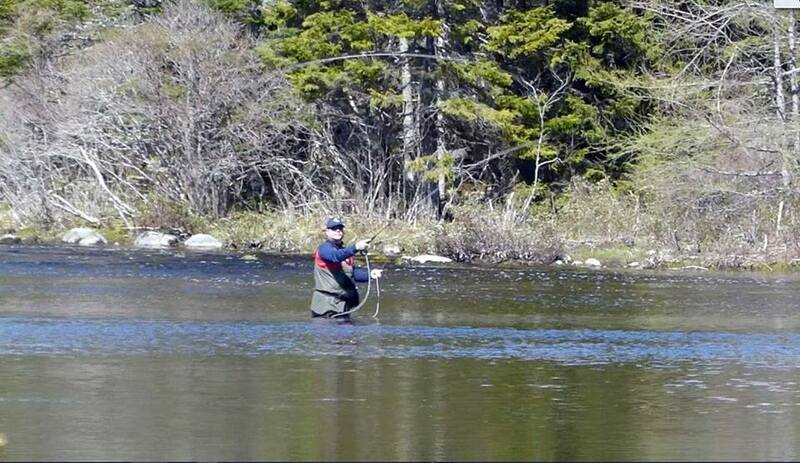 19, 2013 reposted on Atlantic Salmon Federation website. Quick summary of the why, what and how of the lime doser on the West River. E.A. Halfyard, 2008. MSc thesis, Acadia University. The thesis provides photos and details of lime doser on The West River, Sheet Harbour and results of early monitoring. Terrestrial liming to promote Atlantic Salmon recovery in Nova Scotia – approaches needed and knowledge gained after a trial application. The thesis includes data collected after that reported in the paper above, also a lot of background info. about terrestrial liming. See Calcium Depletion on this website. This entry was posted in clearcuts, Conservation, NSDNR, Show Us the Science, Watersheds, WestFor. Bookmark the permalink.